Today is Father’s Day. I am very fortunate to have a wonderful Dad (he dubbed himself Mr. Wonderful and I let it stick) whom I adore. 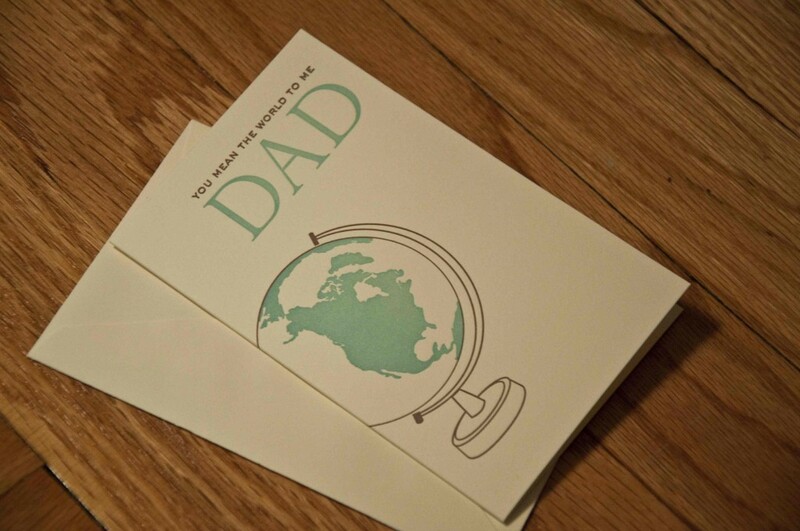 I hope you have the same, or another paternal influence that likes a celebratory meal at a delicious restaurant! This globe reminds me of the weekly summaries you made me to write during middle school. As if having six classes and six homework assignments wasn’t enough, I was the only kid forced to write summaries on them all. No, I haven’t forgotten. I also haven’t forgotten the time you took my dolls away or when you signed me up for co-ed basketball during my formative teen years. But that’s not all I remember. I remember you teaching me how to hit a baseball (albeit with a large and forgiving bat). We’d play for hours in the backyard, with your dirty laundry serving as bases. We developed a fierce little bond during those weekends when Mom was flying and Marie Callender was in charge of dinner. I remember your unwavering support when the job I loved was lost to the recession. You allowed me to feel sorry for myself, but only for moment. With your encouragement, I picked up the pieces and kept on with the journey. I am so grateful for you–for your good advice, your support, and most of all your love. You have made me the person I am today. (And you did a darn good job if I do say so myself.) I love you. Happy Father’s Day Mr. Wonderful!